Today, Sailu’s Kitchen has completed 7 years. I find it hard to believe that I have been blogging since 7 years. Time sure flies fast. 🙂 Dear readers, thank you from the bottom of my heart for your good wishes and encouragement. Without your support, there is no way I could have come along these 7 years. I am humbled by your love and ever grateful for your kind comments and positive feedback on the recipes posted here. I hope to blog on a more regular basis and bring to you many more recipes in the coming years. For the blog’s 6th birthday, there was an Apron giveaway where 4 lucky readers had each won a Kalamkari Apron. For the 7th blog anniversary, I have a gift for each one of you, dear readers. You all deserve it. I am offering a FREE Ebook, ‘The Best of Sailu’s Kitchen’ that has 27 all time popular recipes with photos. To download the free recipes Ebook, you need to enter your name and email address in the form below. You will be taken to the download link of the Ebook ‘The Best of Sailu’s Kitchen’. 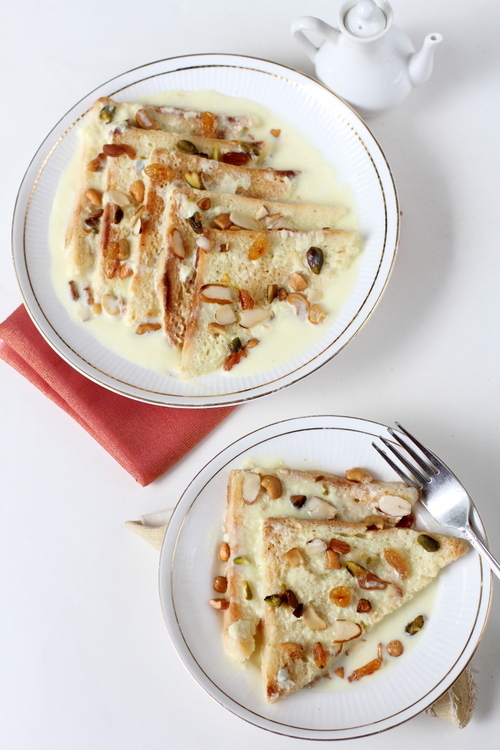 My blog birthday calls for celebration and with Diwali around the corner, I am posting Shahi Tukda so that you can make it as part of your Diwali sweets platter. Whenever I have any left over bread, I tend to make garlic croutons, bread crumbs or bread upma. If my family is in a mood for a dessert, I make Bread Halwa which can be prepared in less than 30 minutes. Place milk in a thick bottomed stainless steel vessel and bring to a boil. Reduce flame and allow it to reduce to half its original quantity. Add saffron milk and mix. Turn off heat and bring to room temperature. Add 4 tbsps of the prepared sugar syrup (process to prepare sugar syrup in Step 2) and mix. Chill till serving time. In another bowl, place sugar and water. On low to medium flame, let the sugar dissolve completely. Once it dissolves completely, allow to cook for 4 minutes. Turn off heat. Keep aside. Heat a non-stick pan and drizzle a tsp of ghee over it. Add dried fruits and nuts and toast for a minute till brown. Remove onto a bowl. Drizzle 2-3 tsps of ghee in the same pan and place 3-4 triangles. Toast the bread to a golden shade on both sides. Remove and place on a plate. Drizzle the remaining ghee, and toast the remaining bread triangles to a golden brown shade. Dip each toasted triangle in the sugar syrup to coat both the sides and remove onto a serving dish. 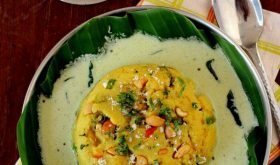 At the time of serving, pour the chilled saffron flavored thickened milk over the bread slices, garnish with toasted nuts and kismis and serve. Alternately, you can deep fry the bread triangles and place on absorbent paper and follow rest of the procedure. The authentic Shahi Tukda recipe calls for the use of full fat milk and heat the milk to reduce it to more than half its original quantity. It should have a rabri like consistency. By Sailu Published: November 8, 2012 Shahi Tukda, a simple sweet recipe for my blog birthday. 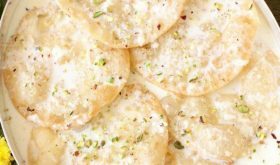 As part of your Diwali sweets platter, learn how to make Shahi Tukda aka Shahi Toast or Sahi Tukra. Congratulations Sailu! You have not only offered us delicious recipes but also inspiration to have love for cooking!! Thank you and God bless you! Congrats and this is an awesome dessert to celebrate! Love the all white styling! Congratulations Sailaja.. Way to go.. The pictures are making me drool – Love this dessert !!! Your blog was one the food blogs that I came across when I started blogging and you have been a real inspiration for many food bloggers like me! 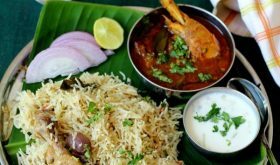 Your creativity and genuine fondness for good food comes across every individual blog post of yours through vibrant food photographs and beautiful narration. Here is wishing you many more wonderful years of this culinary adventure. 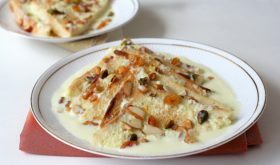 Congrats and happy blog anniversary.. Shahi tukda looks inviting and love the pictures.. Happy 7th blog Anniversary! Yummy desert – thanks for sharing and a huge thanks for the delicious recipes you post. I receive so many compliments when I make the dishes from your blog! Congratulations…. God Bless you… You will Keep Growing…. Coz Your Dish Was Inspire to many and got apperication with loved one By the Receipe You Posted here… ALways rock!!! Congratulations Sailu…..yours is one of the best blogs i have come across!!! You give such approriate instructions and beautiful mouthwatering pictures – it inspires one to try the recipe right away! Happy Birthday to ur blog and congrats to u! My husband introduced me to ur blog and we both love trying out ur recipes. 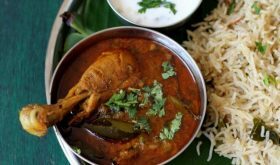 Our all-time fav so far has been the tomato-peanut pachadi… such a sinple, yet flavour-rich dish! Keep up the good work.. all the best! Wish ur blog many more happy birthdays! congratulations,Our family loves your blog and we have tried several of your recepies.I keep checking for your latest recepies.Thank you,and hope you carry on! Shahi Tukda usually has more rabdi like milk on it, which is thick. You are right. The bread is also more golden brown. Sailu, no offense, but this looks like bread soaked in milk drizzled with nuts. Absolutely no offence, Raghu. I have mentioned above that the recipe I have posted is slightly different from the authentic version as I have not deep fried the bread to reduce the richness (reduce the calories) of the dish. Deep fried bread has a dark golden shade. I shallow fried the bread in ghee and hence less color. I used low fat milk and just thickened it without making it like rabri like consistency. Congratulations Sailu on the 7 th blog anniversary…..I have been a secret admirer all the way till now.One of my cousins introduced me to your blog couple of years ago and I have been a regular visitor to your blog since then.I love the way you present the recipes with your own personal touch and beautiful pictures.I recommended your site to many of my friends and family members.I really appreciate your passion and all the effort you put in presenting the recipes to us and hope to see more tasty recipes in the years to come. Congratulations Sailu! You have been an inspiration to many like me. Wish you all success! Congrats Sailu on 7 great years!!! And thank you for sharing your wonderful recipes. Congrats! Thanks for posting such easy and delicious recipes. Thanks to you that i have learned to cook. Congratulations Sailu. I love all of your recipes. Thank you for giving us such a nice cooking recipes in Ebook. Best wishes for your future blogging. Hearty Congratulations !! and keep up the good work. You are an awesome example of giving back to the community. if i’d like to try some new / good dishes, you are the first one that comes to my mind. thank you so much. Is there a full version of the book coming out ? I think you should do it. It will be a great success and you will see how much people around the world love you without knowing you personally. Congrats again. Heart felt congratulations Sailaja garu!! As much as i like your name, i love your blog more than that. 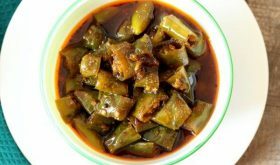 The recipes you post here are simple and easy as well as delicious and turn out to be our delicacies. Iam from vijayawada back home, and residing in Irving,Tx and i truly enjoy your blog, and the feeling that “oka telugu ammayi blog idi”, that thought itself is soo refreshing and keeps me up, in these daily schedules. You are doing an awesome job Sailaja garu, and keep up the good work. Thank you for all the delicious recipes. Congratulations!! Will try making sahi tukra some day. Haven’t had it ever. Congrats Sailu, keep on rocking.. 7years of blogging that truly wonderful. Congrats Sailaja!!! Your blog is fantastic and all your recipies come out great. I have reccomended your blog to many of my friends and we routinely discuss what we’ve tried making from your blog:-) Keep up the good work and wish you many more sucessful years ahead. Have you thought about writing a cookbook???? Heartiest congratulations sailu! You are fabulous! Keep up the good work! work and let us have more recipes often. Congratulations Sailu! what a glorious journey it has been…. you were one of the first bloggers that i found and no doubt was inspired by… cheers and all good wishes for many more wonderful blogging years! Congratulations for completion of 7 successive year of making other tummy happy 🙂 …. 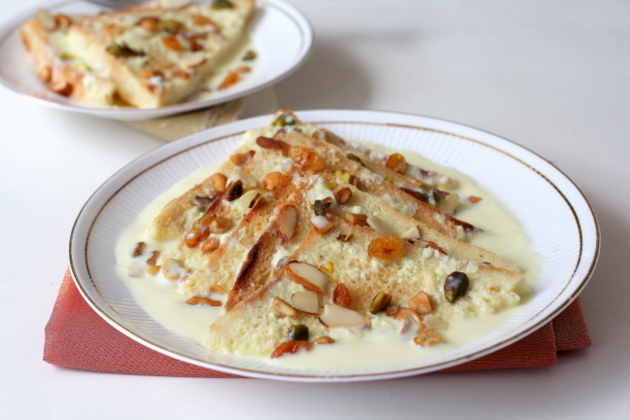 And have to tell the logo looks amazing …..
For sure will try this healthy version of shahi tukra for this diwali …. Congrats and thanks for the ebook! Congrats. Thankyou for all the wonderful recipes. heartiest congratulations to you sailaja!! !